“I moved here from Baltimore, Md., with my two children in 2011. I didn’t have a real plan. And let me tell you that’s scary, particularly for a parent. 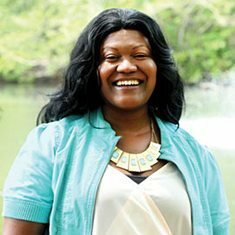 After trying to make a better life for myself on my own, I realized I needed some help, and this was when I learned of Goodwill and GoodWork Staffing.” – Cassandra, a formerly homeless single mother and client of GoodWork Staffing. Cassandra was a temp-to-hire employee through GoodWork Staffing at the Mecklenburg County Health Department, where she was hired on permanently and full-time with benefits in October 2013. Cassandra was one of three recipients awarded Goodwill’s 2015 Cornerstone Celebration GoodWork! Award.